You’ve noticed that your favorite hiking trail has become littered with plastic water bottles and soda cans. The creek is getting darker and more polluted. The park could use sprucing up. You really want to do something, but everything costs money. Even if you get neighbors to volunteer to help with a clean-up, there may be additional costs for equipment or safely removing trash and debris. If more expertise is needed, there is cost to hire experts. Sloop Clearwater sailing on the Hudson River, via Wikimedia. Folk singer Pete Seeger popularized the ability of ordinary people to improve the environment with his ship, Clearwater, which went along the Hudson River in New York cleaning it. Fund raising has come a long way since then. You can do almost anything on the Internet. 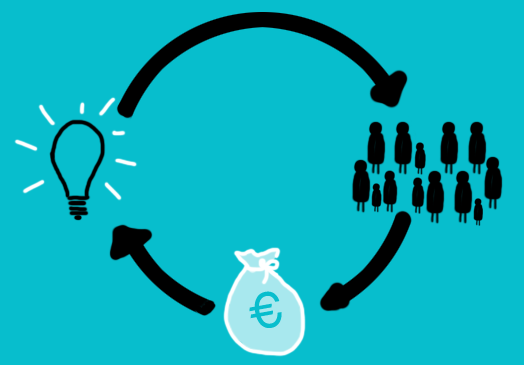 The concept of crowdfunding has ballooned. Crowdfunding is raising money online for specific causes, projects or events. There are two models: donation and investment. Donations involve raising funds for a cause, while investment may be to support a start-up business or a new product. Musicians, social entrepreneurs, people with creative projects, even mobile app developers are raising funds through crowdfunding. There are numerous crowdfunding companies. Their websites serve multiple purposes. One is for organizations seeking funds to post their cause. Second, is to draw interested individuals to donate money to the cause. According to the Crowdfunding Industry Report by Massolution, $2.7 billion was raised in 2012 from 1,000,000 projects worldwide through crowdfunding. The projection for 2013 is $5.1 billion. That is among the attractions of crowdfunding: the local and global effect. The Internet has made us closer, so people can donate to a cause at the other end of the world. At the same time, an issue that strikes close to home in our neighborhoods can bring the community closer together working toward a common goal. Not all people are comfortable going door-to-door asking for money. Some neighbors don’t want to hear your speech. Not only does crowdfunding provide a more comfortable platform, but the potential network of donors can extend beyond your immediate block. There’s been a change in grassroots politics in raising money. E-mails asking for $3 or $10 make the donor feel comfortable giving a small amount and feeling good about being able to participate. Smaller donations bring more people participating in the process. The same concept is at work with crowdfunding. What about crowdfunding for the environment? Creeklife, a grassroots company, has launched a crowdfunding site geared specifically toward environmental issues.Its goal is to bring local people and their watershed environment together. The company thus far has every watershed in the country mapped. You can use Creeklife to raise funds for salaries, thereby creating jobs, or helping people affected by a natural disaster. It may be the only site dealing solely with the environment.